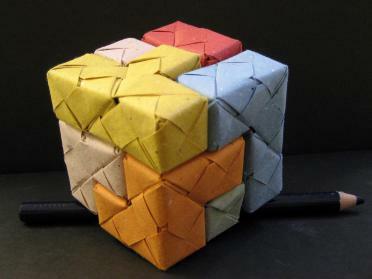 Last column, we saw some of the basics of modular origami with the Sonobe unit. Today’s post is mostly a gallery of a few of the limitless cool things you can do with this unit. 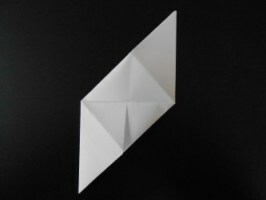 But first, a note about chirality. 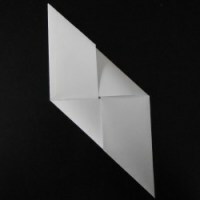 A three-dimensional object is chiral if it cannot be superimposed on its mirror image, which means that it has no plane of bilateral symmetry. And in fact, the Sonobe unit is chiral. 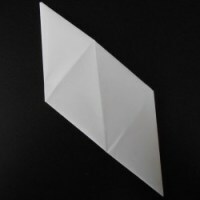 For the units we made last time, you folded one top corner to the right, so we will call those right-handed Sonobe units. 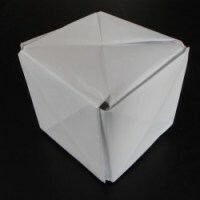 It is also possible to fold the other top corner to the left, and that produces a left-handed Sonobe unit. You may read on the web that “you must never mix left-handed and right-handed Sonobe units.” Like many things you find on the Internet, that’s an exaggeration. A right-handed unit turned upside down will play perfectly nicely with a left-handed Sonobe unit. 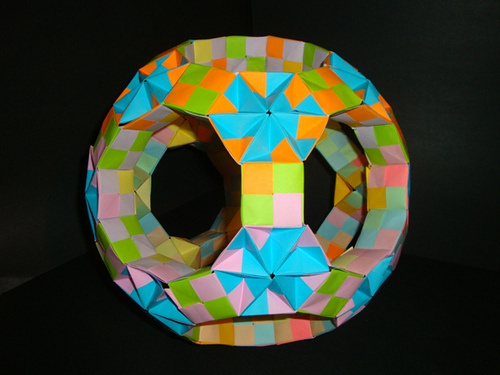 And you can use that fact as a tool to control when the “X” side of a Sonobe unit (the side on top in the first two pictures) is on the outside of your sculpture, and when the “smooth” side of the unit (visible in the last picture) is on the outside. For example, can you figure out how many left- and right-handed units it takes to make this cube with two X sides and four smooth sides? 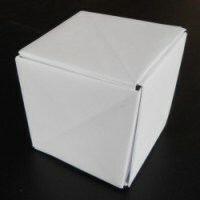 Or for another, how many of each do you need to make this cube with all smooth sides? 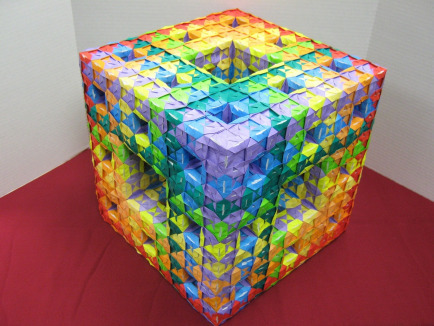 In any case, turning back to some of the amazing things you can do with Sonobe, here’s a second-order Menger Sponge by Ardonik: And a mini-Sonobe Soma Cube by Flavia Poma: A rhombicosidodecahedron made from 180 units, also by Ardonik: And to wrap up today’s gallery, a great rhombicosidodecahedron with 510 units by Origami Tetsujin: If any of these pictures have inspired you to make something wonderful with Sonobe, mondays@momath.org would love to hear about it. 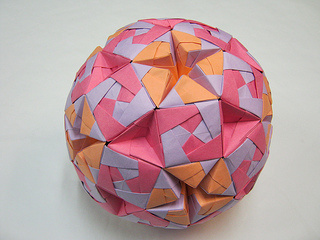 This article first appeared on Make: Online, April 1, 2013.